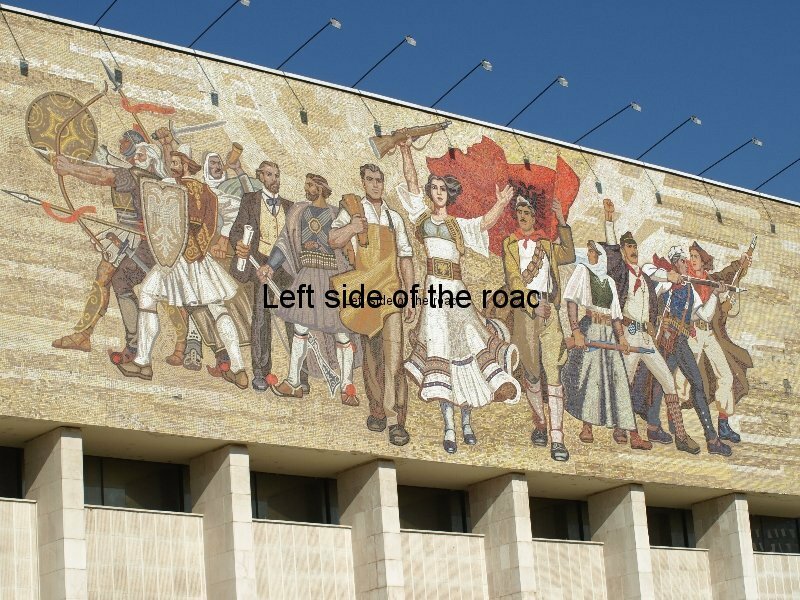 ‘The Albanians’ mosaic on National Historical Museum, Tirana, is one of the finest examples of late Albanian Socialist Realism still to be seen in the country. 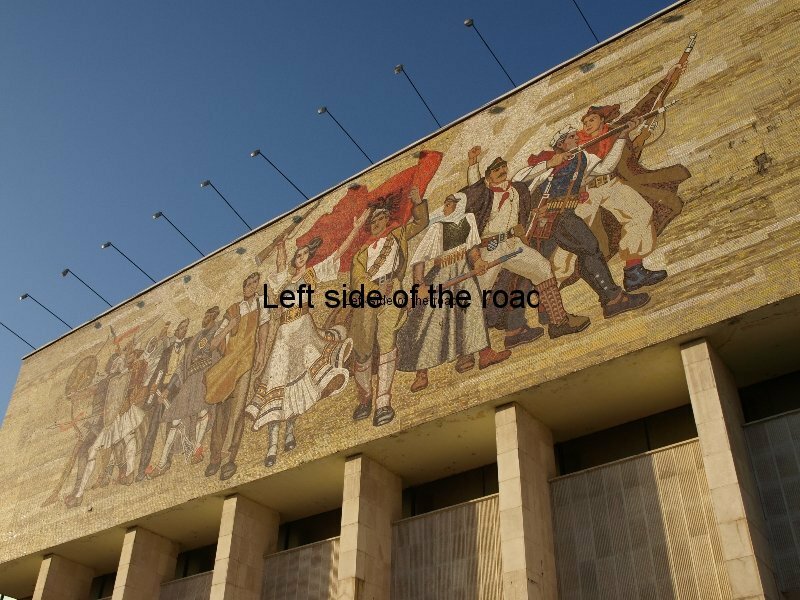 For most visitors to Albania the example of Socialist Realist art they would have seen is the mosaic, called ‘The Albanians’, situated above the main entrance of the National Historical Museum in Skënderbeg Square, Tirana. The work is the result of a collective of five Albanian artists – Vilson Kilica, Anastas Kostandini, Agim Nebiu, Justin Droboniku and Aleksander Filipi – and was completed in 1980 for the opening of the museum. This is huge, covering 400 m², and dominates one end of the main square in Tirana. 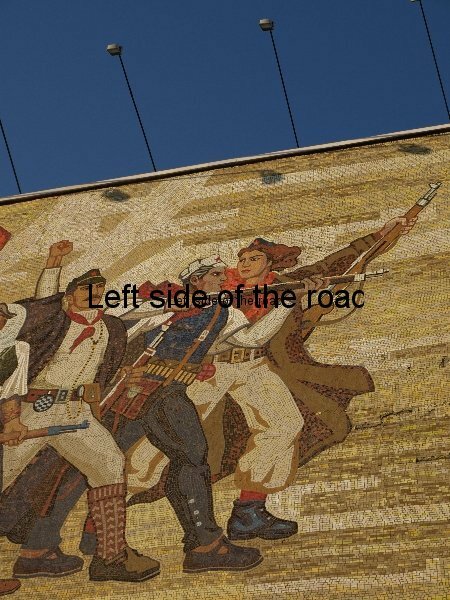 Fittingly, as it decorates a historical museum, it tells the story of how Albanians have fought against invasion and occupation throughout the centuries. Being one of the smallest states in the Balkan region (until the former Yugoslavia was broken up into smaller and even smaller western friendly ‘nations’) Albania was considered fair game by whatever was the dominant imperialist power around at the time. Before talking about the mosaic in some detail a quiz question. Take a look at the picture at the top of this post and see if you can work out what is particular to the three women depicted, in a form that you are unlikely to see in any capitalist country? On the left as you look at it is concentrated almost 2000 years of defiance towards the invaders, going back to the Roman Empire, which later changed to Byzantine control, that being usurped by the Bulgars, from what is now modern-day Bulgaria, in the 7th century. The major, and longest, running battle was against the efforts of the Turkish Ottoman Empire to control the small mountainous country, this being the period when Skënderbeg became the national hero. All these invading cultures have left their mark on the culture, architecture and language of the Albanians. Also among this group is the representation of Albania’s Declaration of Independence in 1912 – the man in a suit with a piece of paper on his hand is Ismail Qemali. On the right is depicted a very specific and the most recent and most successful National Liberation struggle, the one against, first Italian and later German, Fascism between 1939 and 1944. 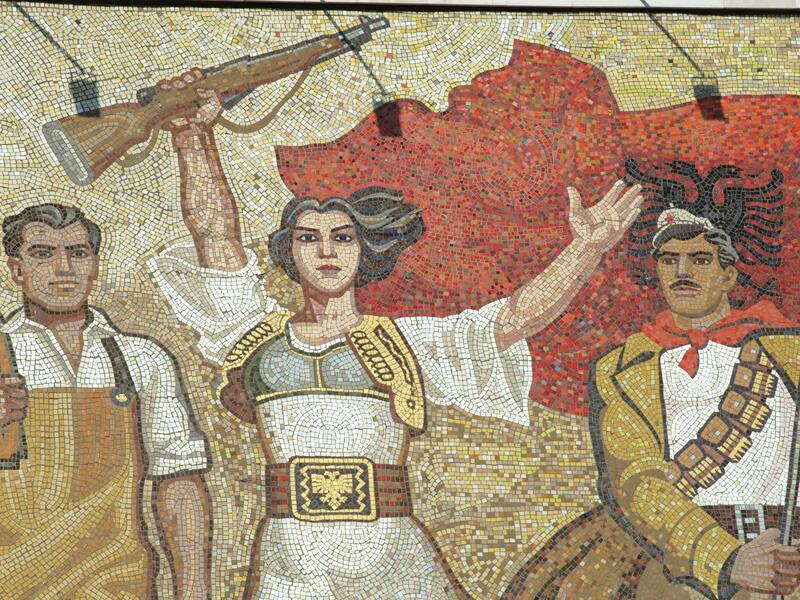 The red star on the caps of three of the four individuals indicate they are Communist Partisans, where armed men and women fought side by side. 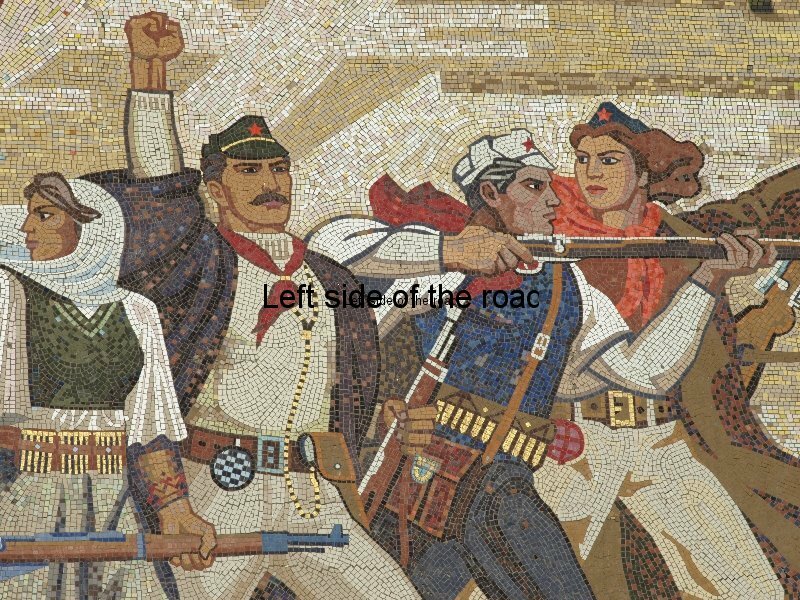 The trio in the centre represent, what was then the present in 1980s Albania, workers in control of their country, the red flag flying, the guns in the hands of the workers and united they are marching forward to a Communist future. That march has been halted, temporarily, but there is still an element of hope depicted in the determined way the trio are walking towards the viewer. However, what you see is not the original. Sometime after 1990 (I’ve yet to discover exactly when ) the mosaic was ‘depoliticised’, at least partially. 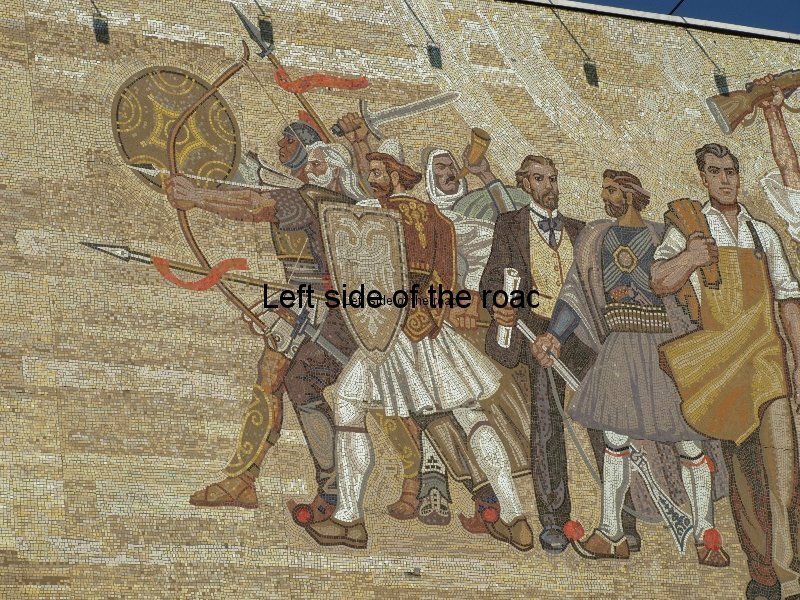 There were probably those who wanted to see the total destruction of the mosaic (as has happened in other places, such as the wall of the National Library just across the square from the Historical Museum and the monument to the ‘Four Heroines of Mirdita’) but the compromise was, nonetheless, cultural vandalism. And the ‘artist’ responsible for this crime was one of the five who created it in the first place. The criminal’s name is Agim Nebiu. He didn’t do so for any political reason, he did it for money. Like so many artists he was/is cheap. One of the problems with ‘intellectuals’ and ‘artists’ under Socialism is that they are so ‘special’ (or they think themselves as such) that they throw a hissy fit if they are expected to create something which might not fit into their ‘artistic’ sensibilities. If from a working class or peasant background they would never have had the chance to learn their trade if it were not for the Socialist Revolution but once having gained those skills they turn their backs on the people who provided them with previously unheard of opportunities. They adopt the attitude of many ‘artists’ under the capitalist social system, that they should be ‘free’ to ‘express their creativity’. That they hold no debt to those workers who have enabled them to have the luxury of a higher education. When someone throws thirty pieces of silver on the table they grab them with both hands. They declare that now they are ‘true artists’, not following the diktats of the state. They are no such thing. At least prostitutes are honest. 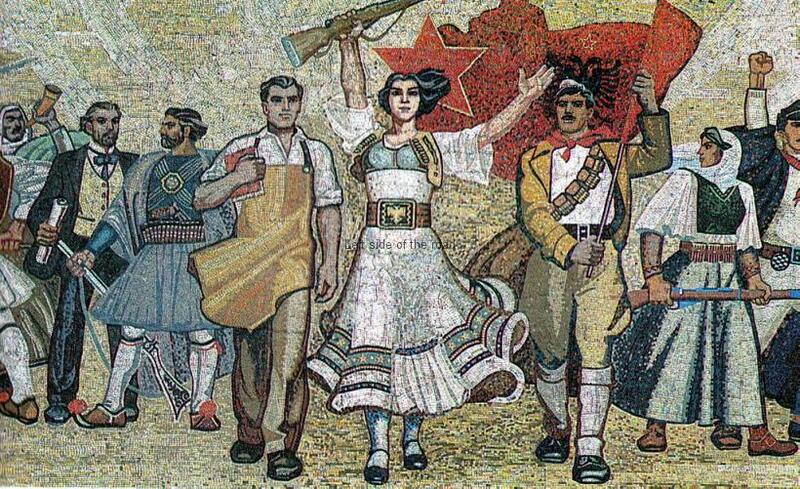 Stars are crucial to Albanian Socialist Realist Art. They determine the meaning of the story. 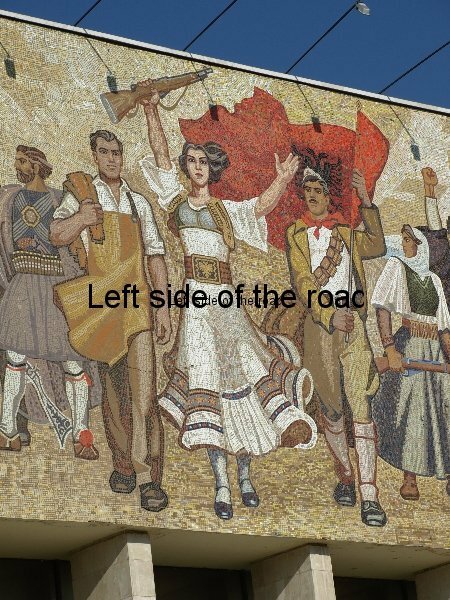 There is no shadow of a doubt that the Fascists would not have been thrown out of Albania, by the Albanian people themselves, if it were not for the political direction given to the struggle by the Marxist-Leninists, those members of the then Albanian Communist Party (later to be renamed as the Party of Labour of Albania). The self-proclaimed ‘king’ Zog fled when the Italians landed in Durres in April 1939 and lived in luxury in Britain. The nationalists of Balli Kombëtar sat down with the Nazis and were bombarded by the Communist Partisans from the hills of Sauk. 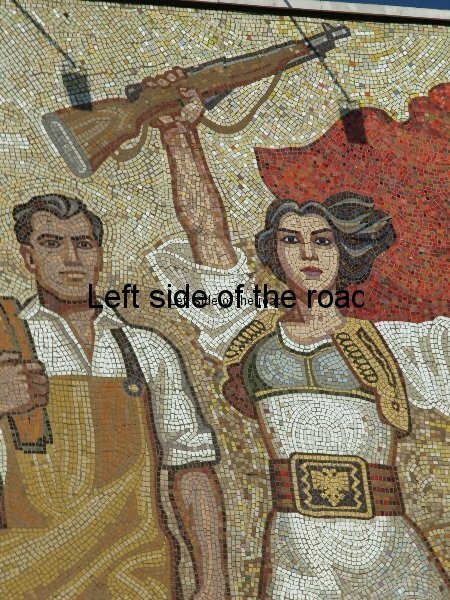 True partisans, like young Liri Gero – a true daughter of her country and living up to the meaning of her name (Freedom) and who was tortured to death by the odious Nazis – followed the Communist banner. On that banner was the golden star of Communism. That star was anathema to the counter-revolutionaries who gained power after 1990 and throughout the country that symbol, so hated by capitalism and its lackeys, has been the target of official and unofficial vandalism. The mosaic is an example of the official. Below is a detail of the original mosaic, as it was planned and executed by the group of five artists in 1980. Notice that there is a large golden star above the head of the woman in the centre of the picture. If you now look at the close up of that middle section below can you spot an anomaly? Doesn’t the flag look a strange shape? Flags are normally rectangular but this one looks like it’s a piece of cloth cut totally at random. That’s because the corner of the flag between the woman’s head and her upraised rifle is where the star used to finish. What has happened is that the gold star pieces of ceramic have been removed, replaced by reddish pieces and then a bump of red inserted between the original folds of the flag and the corner. If the flag followed its original shape the corner would have been behind the woman’s head. The pieces of ceramic are also a slightly different colour and they have a different orientation to the originals. It must have been difficult to get exactly the same pieces at least 20 years after the original was installed – not least because all the factories that would have made the original tiles have been closed down and now lay derelict. You’ll notice the same disparity if you look above the twin eagle heads on the flag. During the Communist era there was a small gold star here and that also has been obliterated, but a close examination of the area shows that something is amiss. A third change is to the depiction of the male character on the right of the central female. Originally he carried a red book in his right hand, holding it against his chest. 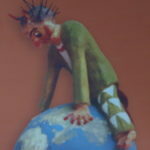 In the vandalised version he carries something that looks like a sack. This is plainly ludicrous. In all forms of art, especially Socialist Realist art, everything has a meaning. Carrying a book means education (denied the majority of the population before 1944 and something that was a principal aim and achievement of the Socialist society – although there has been much privatisation of education in Albania in the last 25 years the popularity of the annual book fair in Tirana in November shows the love that still exists for books within the country). Carrying an empty sack means … what? The same as in the empty sack … nothing! To have just removed the book would have meant that the character would look strange. Why have an empty hand across his chest. In the context of the three of them marching it would be more realistic if his right arm was hanging down by his side as people do when marching when not carrying anything. To have changed his stance would have been a major task indeed so Nebui took the easy way out and substituted the book with the sack. If it is easy enough to understand why the stars were removed it begs some interesting questions when we talk about a book. This is tantamount to book burning – which did take place outside what is now the Adrion book shop just across the square during the counter-revolution of the early 1990s. To me it’s also symbolic of the attack on education for all, at the state’s expense, a principal of all Socialist states in the past but something which has also been privatised in all post-Socialist states. Education is now a privilege and not a right. When I first went to Tirana in November 2011 the whole of the front of the building was covered with scaffolding, which was finally removed in time for the Independence Day celebrations on the 28th. 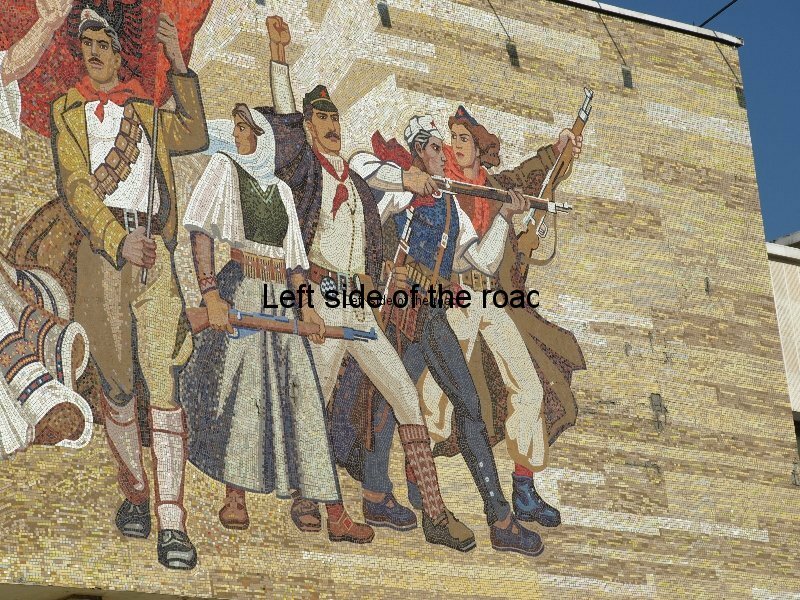 I don’t know what sort of work was carried out on the mosaic but what surprises me is that the red stars on the caps of the Communists have survived. Now the answer to quiz posed at the beginning. ALL the women are carrying arms! OK, there’s only three of them but that’s still a hundred per cent. And this is quite common in the depiction of women in Albanian lapidars, such as in Fier, Lushnjë, Saranda, Librazdh, Pishkash, the,sadly destroyed monument to the Four Heroines of Mirdita, the first Party Cell in Proger, Liri Gero and the 68 Girls of Fier, the Drashovice Arch and many others yet to be written and posted. But apart from the ‘official’ re-writing of history we have neglect. Just from the street it is possible to see that the mosaic is starting to crumble. Bits are falling off and there’s obviously no concern to repair a unique piece of art, even from the Social Democrat government at present in place. That shouldn’t be a surprise. Tony Blair, the traitorous warmonger who was able to woo the British population to his mock Tory politic, now ‘advises’ his protégé, Edi Rama, himself the son of an Socialist sculptor and a trained artist, but basically a philistine more intent on self-enrichment than the preservation of his country’s culture. Close up photos show just how bad the degeneration has become. Wonderful as such art is, and making a statement that has yet to be fully developed, celebrating the working class in a manner that has never been made before, a working class that doesn’t struggle for a better future doesn’t deserve such art. Let them live with the banality of the celebrity culture, reality TV, cake making competitions, Coca Cola and McDonald’s. Until they attempt to change the world for the betterment of themselves and those that follow that’s all they are worth. The slideshow below shows some of the detail of the mosaic and also, sadly, signs of neglect and cracks in the design itself. If something isn’t done soon we will find pieces of ceramic falling on the heads of those entering the museum. 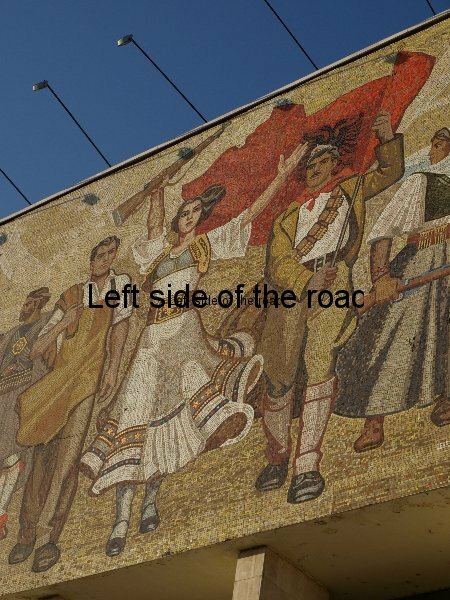 This entry was posted in Albania, History, Monuments and Memorials, Socialist Realism, Travel and tagged droboniku, filipi, kilica, kostandini, mosaic, national historical museum, nebiu, socialist realism, the albanians, tirana by Michael. Bookmark the permalink. What an ignorant view to have. The young are leaving the country because of the severe lack of jobs, lack of economical globalisation and ridiculously corrupt government. No woman chooses to become a prostitute out of luxury, but out of necessity. And the reason the principle export is arms is because Albania was armed to the teeth by Russia and China during the Communist era for fear of being invaded – when you are the seventh poorest country in Europe, you will sell what you can. Albania is home to countless priceless Byzantine artefacts, Illyrian strongholds, Venetian architecture – unfortunately, with a GDP of 11 billion, as much as they would love to preserve this beautiful history, it isn’t exactly a priority. Not many willingly choose to leave the country they love and belong to, but making money in, “capitalist heavens” so that they can send it home to their starving families is a priority. And with all due respect, the resilience, hospitality, loyalty and integrity of the Albanian people (despite their severely corrupt leaders, constant invasions and their status as a peripheral) far outweighs most societies I’ve experienced. But you continue with your analysis of a mosaic from your ivory tower. I sometimes wonder at the Albanians who take exception to some of the things I write on my blog. I honestly don’t understand the world you live in, or, at least, the way you look at that world. First of all I’ll make an admission. Although I supported the Party of Labour of Albania and agreed with the vast majority of its policies from 1944 to 1990 mistakes were obviously made. What they were and how I see them in retrospect is something that will take too long to introduce here. Whilst saying that the blame of what happened at the end of the 1980s – and especially during the 1990s – have to be placed at the feet of the Albanian people themselves. For reasons I still don’t fully understand they just gave up on everything and too many of them just wanted to get to the capitalist west so that they could ‘enjoy’ the fruits of capitalism. The fact that they were so stupid as to not realise that all that came with negative consequences seems to have been ignored by those who left at the time and haven’t been accepted by them, or many others, since. I have no doubt that the situation in the country became more difficult after the desertion by the Chinese revisionists and the consequences of the isolation that Albania had to suffer following this betrayal. But for Albanians that shouldn’t have been a problem. All your history, prior to the liberation from fascism in November 1944, was predicated upon the struggle for independence. The cult of the personality of Skenderbreu was well established before the defeat of the Italian and German fascists. Whether it was a healthy cult to perpetuate under Socialism is another issue – but as with so many ideas, not something which can be discussed in any depth here. As the ships left Durres and Vlora, in the mad rush to get to the capitalist heaven across the Adriatic, any national pride that those Albanians on board might have had sank in their wake. Durres, where Mujo Ulqinaku was one of those who led the fight against the Italian Fascist invasion in April 1939, was only able to hold its head high for 50 years. As the workers deserted the port, the tobacco factory and other local industries they put an end to any concept of Albanian independence. The celebration on 28th November in subsequent years has been a sham. The once proud Albanian Army is now just a lapdog to NATO. In fact I’ve encountered more foreign troops, in my visits to Albania, than Albanians. And respective governments, of whatever colour, have allowed this loss of independence to be taken away due to the misconstrued idea that by accepting such an unopposed invasion you will be invited to join, at some indeterminate time on the future, the capitalist club that is the European Union – a pipe dream that will only be realised when Hell freezes over. Present day Albanians are a disgrace to Skenderbreu and to the thousands of partisans who fought – and too many of whom died – for your country’s freedom between 1939 and 1944. So once you have prostituted your country it’s not a surprise that you allow your daughters to populate the brothels of western Europe – whether these be run by Albanian gangsters or the scum of other nationalities. You say that Albanians had to leave their own country because there was no work for them there. But it is the Albanians themselves who are responsible for this. In the 1990s it wasn’t a foreign invasion force that destroyed the infrastructure, industry and agriculture. It was the Albanians who did it themselves. In their thousands they deserted the land and the factories. With such a reduction in the workforce any economy would have problems in adapting. Then, on top of the desertion, ‘good’ Socialist Albanians allowed ‘bad’ monarcho-fascist, reactionary and foreign agents to put the final nail in the coffin. By not defending the collective farms and the state industries those people who had developed a Socialist conscience allowed reaction and capitalism to prevail. They allowed the enemies of Socialism, who exist in any Socialist society for many years (we still don’t don’t know how many) after a successful revolution, to destroy all the gains made over many years of sacrifice to turn a backward, semi-feudal country into something resembling a modern state in the 20th century. I hate and detest the enemies of Socialism but, and this is a lesson of history, those who don’t defend gains from the past also have to bear some of the blame. Crimes of omission can ultimately have the same consequences as crimes of commission. You talk of a ‘need’ to leave the country. I assume you are Albanian but haven’t you seen the innumerable deserted and looted factories, abandoned greenhouses and the results of privatisation of land that has led to the destruction of collectivised and state agriculture and returned Albanian agriculture to something resembling feudal strip farming. Obviously not, otherwise you wouldn’t write such rubbish. If you still live in Albanian perhaps you should travel a little bit more. You words betray a lack of knowledge bordering upon parochialism. Have you no knowledge of the abandoned factories and industrial complexes of; Elbasan, Fier, Gijrokaster, Lac, Korca, Permet, Pogradec, Prenjas, Vlora, Berat, Durres, Shkoder, Kucove – to just mention the biggest and most obvious? Have you not seen the hundreds of railway engines and rolling stock just rotting away beside the railway lines throughout the country (especially in Vlora and Prenjas) which indicate the amount of material that used to be, in the Socialist period, transported from one part of the country to another? You make the bizarre statement that I am making my analysis from an ‘ivory tower’. I have travelled extensively in Albania and have seen the results of the last 25 years of capitalist ‘renewal’. I have heard about countless examples of corruption and mismanagement. I have met many people whose greatest ambition is to leave the country of their birth as soon as possible. With such a background Albania has no future – apart from being a low income economy where only those who can’t escape live and work in ever worsening conditions and for lower pay. In the 1990s. When Albanians were destroying (or allowing to be destroyed) their industrial infrastructure I and many other workers in Britain were fighting to keep our factories open. Yes, we failed, but at least we tried. What did you do? Depending upon your age you were either a destroyer or a passive watcher. Whichever of the two you then, under the new ‘won’ capitalist ‘freedom’, were incapable of constructing a viable, modern society. Added to this you also freed from centres such a Spac those vicious, greedy psychopaths who then caused untold havoc on the country. I’ll accept that some people were imprisoned when other methods could have been used but all societies have to deal with individuals who have no concern for anyone but themselves and who are prepared to do anything to get what they want. I don’t have the perfect answer to how to deal with them – do you? Disagree with my analysis but don’t just think you can do so by claiming that Albanians are hard done by. In the 1990s the Albanians made their bed, now they have to lie in it. That can be changed but not if all Albanians do is whinge about being innocent victims and/or run. I’ve met some great people in my travels in Albania but, unfortunately, very few who want to rebuild their country for the benefit of all – that would mean the fight to reconstruct Socialism. I think you will find that the red book symbolises both the official Party history ‘History of the Party of Labour of Albania’ and also the Veprat (Works) of Enver Hoxha, as much as education. You see the same book being held/read in paintings and artworks in the National Gallery and other museums. 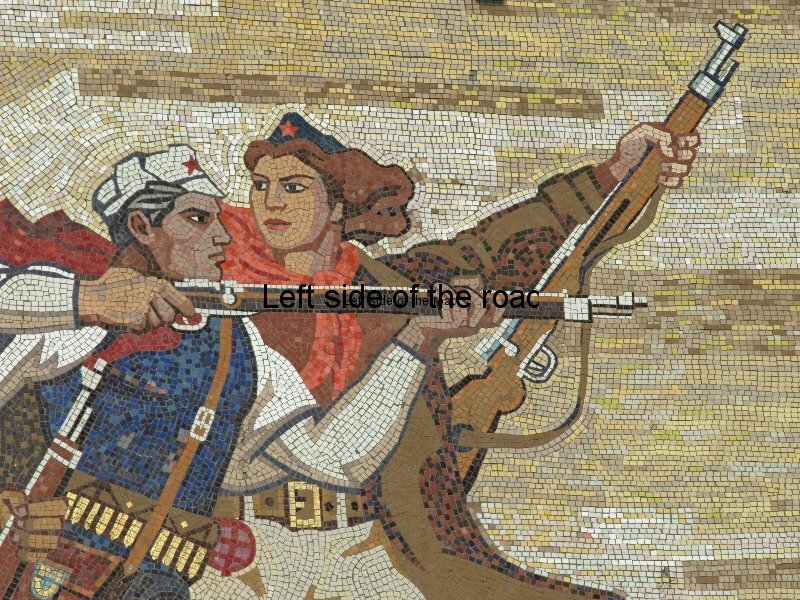 It is thus overtly political and no surprise at all that it was removed from the mosaic. In 2011 the scaffolding was for the awnings that it held, i think, rather than any restoration and indeed the Democrats proposed removing it entirely. I do not believe anything was done about it, though it is now an a very shoddy state, with bits missing. I will accept the History of the Party of Labour but not the works of Enver Hoxha (none of the collected/selected works of the great Marxist-Leninists were published in red). But I will still hold to the idea of the book representing education in general. A worker with a book is dangerous. A worker with an empty sack is just taking home what he controls of society under capitalism – nothing (so, perhaps, an ironic statement by the vandal artist?). Capitalism wants workers to be constantly occupied watching seemingly endless games of football (or other sports) or reality TV shows – none of which encourage thinking about the situation in which they find themselves. If they spend their time reading about ideas they might actually get up off their knees and do something about the exploitation and oppression they face on a daily basis. Thank you for a very interesting article. I am from the Soviet Union and the Social Realism is the art I was brought up with. I love it, and looks like there are more and more people, who appreciate it for all different reasons. I like your site and your desire to show the facts without commenting on them.